Description: The smallest subspecies of the Canada goose, the Cackling Canada goose have been categorized into their own species, Branta hutchinsii. Cackling Canada geese very closely resemble the standard Canada goose, but are much smaller and have small, but distinctive, variations in their head and bill. Cackling Canada geese are small geese with a black head featuring a white chin strap. They have tan to brown bodies and white bellies. Distribution and Habitat: Cackling geese are arctic nesters, preferring the treeless tundra area of northern Canada and Alaska for their summer breeding grounds. 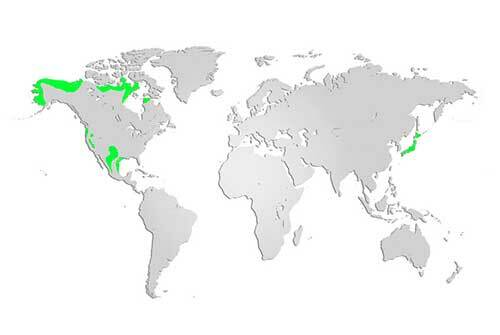 Winter migration destinations include areas from the central USA and south into Mexico overlapping with that of Canada geese. Diet: Herbivorous, cackling geese eat a variety of plant species, particularly aquatic grasses, sedges, grain, and berries. Life Cycle: The nesting behaviour of the cackling goose is nearly identical to that of the Canada goose, nesting in most any kind of wetland area, often on islands. A clutch of 5-7 eggs are incubated by the female and hatch after 25-28 days. Grazers, cackling geese nest early in the spring so their young will be feeding when the new grass and other vegetation is most nutritious. Offspring remain with their parents for a year and typically begin to reproduce at 2-3 years of age. Did you know? 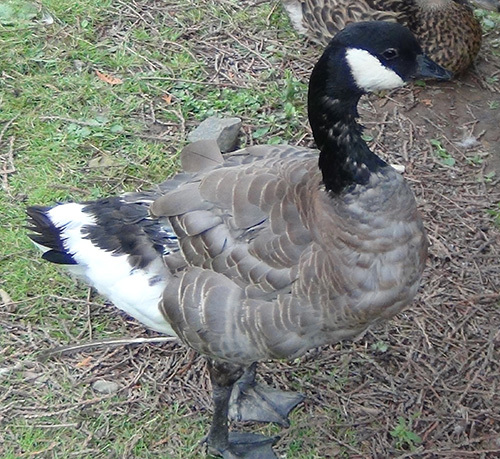 The smallest of the four cackling geese species, Branta hutchinsii minima, is about a quarter of the size of a giant Canada goose, Branta Canadensis maxima.